A studio is a unique classroom space where designers and artists can work with materials, tools, and supplies to create design projects in a workshop environment. Each student has a work area or table for his or her projects. Lockers or storage areas are provided. There is often a critique or pin-up area for reviews of work in process and a large table for group discussions. Studio teaching is a unique pedagogical approach to instruction in the arts and design. The small class size of 15 to 20 students gives you personalized instruction and the opportunity to build your network of friends. It involves the class working on an assigned design problem and each individual reviewing and modifying concepts before resolving a final design solution. This is called an iterative process and is a core component of studio teaching. Design thinking is a fundamental element in the creative process and studio instruction provides students with opportunities to develop this skill. 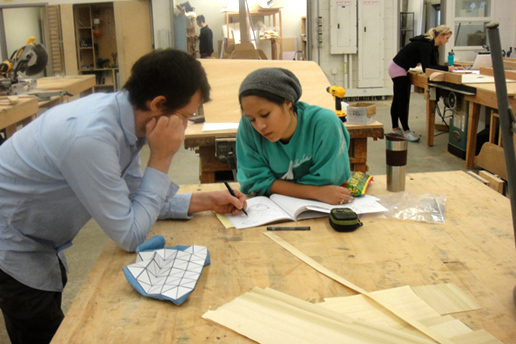 The Department of Product Design uses several locations on the UO campus in Eugene and at the White Stag Block in Portland to teach studio courses. 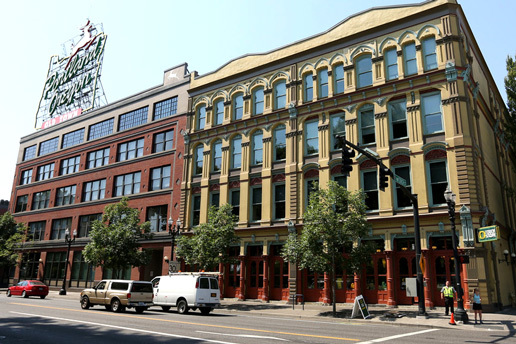 In addition to our classes and studios in Lawrence Hall, classes and studios are offered at the 942 Olive Street building located in downtown Eugene on Olive Street between West Broadway and West 10th Streets. The UO uses this facility in partnership with the City of Eugene’s hub for business start-ups and regional accelerator program, RAIN Eugene. Students have easy access by bicycle or the LTD bus and EmX rapid transit system. The facility is equipped with a computer lab, studio workspace, and critique areas as well as the opportunity to rub shoulders with other inventors and business leaders. 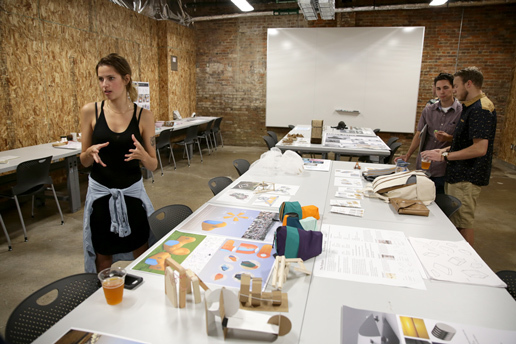 Graduate students in Sports Product Design and Product Design BFA students in their final year use studio space in the White Stag Block and have access to shops and labs in nearby spaces. The building features state-of-the-art technology, light-filled workspaces, a curated art and design library, and exhibition areas. Students have studio space, with a nearby output room and classrooms for lectures. Students in the Department of Product Design have access to a wide range of shops for design, fabrication and prototyping. This is a complete fabrication facility used by product design students and by students in the furniture design courses taught in the Interior Architecture Program. The facility has hand tools, power equipment, and space for building projects of multiple scales. 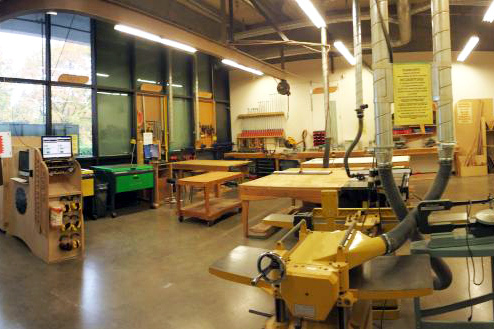 In addition, a plastics shaping tool area, industrial sewing machine area, a computer-programmable (CNC) router table for 3-or 4-axis cutting and milling, and a paint spray booth are located in adjacent spaces in the Woodshop. The Millrace Woodshop is located across Franklin Boulevard from Lawrence Hall, just north of the Urban Farm. Students can access by bicycle or on foot. The Lawrence Studio Shop is a tools resource for students currently enrolled in School of Art + Design courses. The “open shop” environment has been created to provide a safe, and professionally supervised space; in which students can create high-quality projects, while learning skills that further prepare them to excel in their chosen careers. The shop can be used for building models, cutting designs on the laser cutters into plastics or wood, or metals. The studio shop is located in 185 Lawrence Hall. 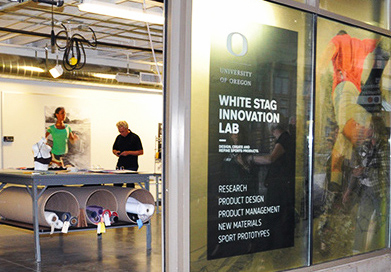 The Fabrication Lab in the White Stag Building is used as an additional prototyping space and a digital fabrication facility for College of Design students at the UO in Portland. The lab is equipped with a LASER-cutter, 3-D printer, computer numerical- control milled machine (CNC) and workshop machinery, and adjacent spray booth. 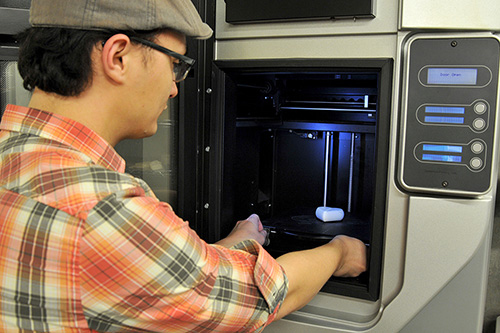 This lab is a sports product design space for teaching, prototyping, and materials research. The lab includes specialty sports product production equipment, including single stitch, cover stitch, active seam flat stitch, post stitch, and serger sewing machines, a strobel, a 3-D printer and a heat press.